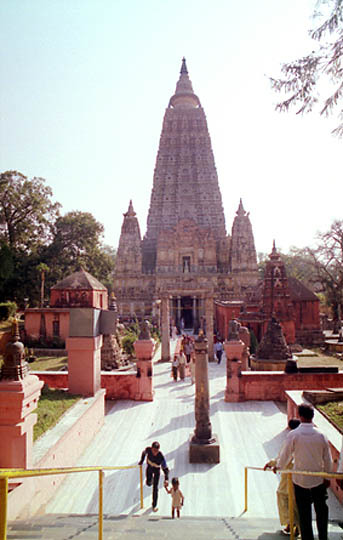 The Mahabodhi Temple in Bodhgaya is one of the few early monumental brick structures to have survived in eastern India. The temple is believed to have been built by the Emperor Ashok, and is decorated with friezes depicting the life of the Buddha. The central tower (55 m high) is a 19th century renovation faithful to the earlier towers that existed on the site. The tower comprises numermous horizontal bands of mouldings and arch motifs that extend upward to an amalaka topped by umbrella-shaped forms, recalling the umbrella motifs found at Buddhist stupas dating back to the time of Asoka and earlier. Along the northern wall of the temple is a raised walkway known as the Chankramana Chaitya - the 'Jewel Path'- where the Buddha meditated as he walked. Adjacent to the temple is a lotus pond believed to have been the place where the Buddha performed his ablutions.